Most records of this species are from southern England and Wales but there are scattered records as far north as south-west Scotland. It is widespread in western and central Europe but the species is not recorded from Scandinavia or Ireland. P. proxima can be found in a variety of sparsely vegetated habitats but typically occurs in moist and marshy places. The species is most likely to be found at coastal sites including earthy cliffs, saltmarsh, dune slacks and in streamside habitats including exposed riverine sediments. P. proxima has also been recorded from lowland heaths and gardens. Although this information is compiled from some quite recent records it is worth noting that the Rev. Octavius Pickard-Cambridge noted the species was present in his garden but he found it in abundance on the swampy flats at Studland 'whence the winters floods had retired' (Pickard-Cambridge 1879-81). Adults are found in spring and summer with males occurring from April to June and females occasionally persisting into August. 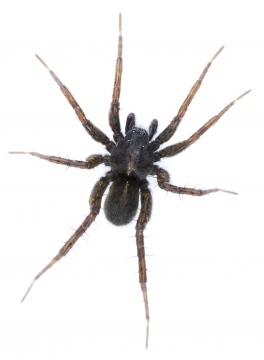 Very local and often in small numbers, though the spider can be abundant in some habitats. The loss of open habitats to seral succession is probably the most important threat. Where not already a natural feature of the habitat such as on cliffs, landslips and riverine situations, small scale rotational disturbance and and the retention or creation of topographical variation to provide seasonally wet habitats are likely to benefit this species.